Twenty-Five-time GRAMMY Award recipient and Oscar winner Stevie Wonder made a special announcement about this year’s 22nd Annual House Full Of Toys Benefit Concert featuring the STEVIE WONDER SONG PARTY: A Celebration of Life, Love & Music at STAPLES Center on December 9, 2018. “This year, the holiday season will not be joyful for some in our California family. Many lost lives, property, and dreams. Imagine a holiday after this tragedy. And so, this year, I am combining my Annual House Full of Toys Benefit Concert featuring Song Party, a celebration of life, love and music, with my House Full Of Hope,” said Stevie. 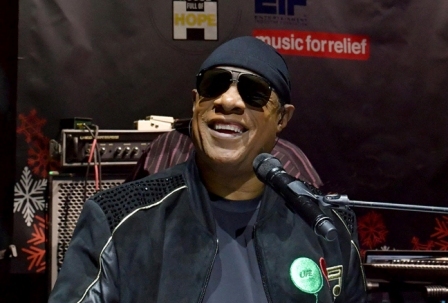 This year as part of Stevie’s House Full of Hope, supporters are asked to donate to EIF’s Fire Fund at www.musicforrelief.org/hope or text GIVE25 to 50555 to make a $25 contribution. Also, concertgoers are asked to bring an unwrapped toy or unwrapped gift of joy on behalf of House Full Of Toys to benefit children, people with disabilities and families in need.